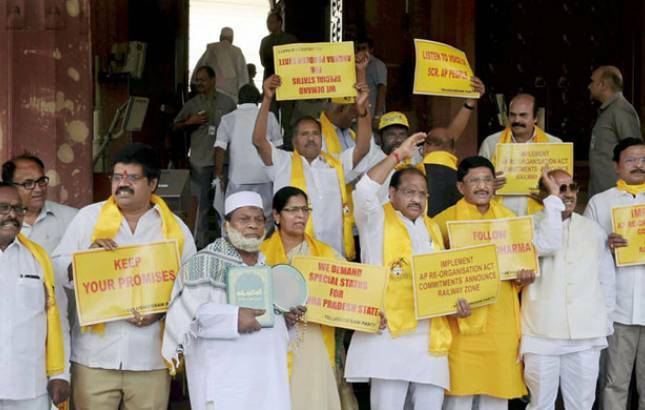 By extending their support to the no-confidence motion, the Opposition parties have ensured that the TDP and YSR Congress are not left short of the required support of a minimum of 50 MPs to get their motion admitted. In a move which has sparked row in Parliament, an overwhelming majority of Opposition parties have extended support to the Telugu Desam Party (TDP) and the YSR Congress, thus backing their no-confidence motion against the Modi government over the non-implementation of the Special Category Status (SCS) to Andhra Pradesh. Bhartiya Janata Party’s (BJP) strongest competition, Indian National Congress (INC) has also extended its support to the TDP and YSR parties and backed their decision of no-confidence motion against the Narendra Modi-led government. The TDP has just 16 MPs in the Lok Sabha, while the YSR Congress has nine. Odisha’s Biju Janata Dal also backed the southern parties and extended its support to the no-confidence motion. The no-confidence motion notices were moved by TDP’s Thota Narasimham and YSR Congress’ YV Subba Reddy. However, the Speaker Sumitra Mahajan refused to take up the motion due to unrest in the House, which led to the adjournment of the proceedings for the day and raised loud protests over various issues.